The Organising Committee (OrgCom) of the European Universities Debating Championships (EUDC or Euros) 2015 in Vienna published their call for international volunteers. Everyone can apply to support the existing crew and be part of the this year’s EUDC. Stage one of the application process consists in reading the International Crew Recruitment Guideline and filling out the International Crew Recruitment Survey. In stage two beginning in mid-April, the OrgCom will contact the applicants if they have questions or need their expertise and knowledge. Stage three is the tournament itself. Everyone can apply for being an international volunteer – the OrgCom emphasizes that age, nationality, gender or lack of experience in debating are no knock-out criteria. The organisers expect volunteers to be available from June 30 in the morning until the August 9 in the evening. The volunteers have to pay for their own travel expenses. During the tournament (August 2-8), they will be accommodated in a hostel paid for by Vienna EUDC; before and after the tournament, they will stay with debaters from Vienna. The OrgCom specified a list of qualities it is looking for in volunteers: Commitment to the tournament, ability to work in groups (and have fun doing so), ability to address and solve conflicts, sharing the vision of Vienna EUDC 2015 and being able to integrate with other volunteers. Questions can be directed to get [dot] involved [at] viennaeudc [dot] eu. 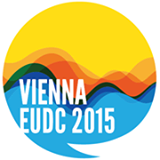 More Information on Vienna EUDC 2015 can be found on their website, their twitter channel and their facebook page. Interested people can subscribe to a newsletter.